It actually pains me to admit I’ve been here a million times before, and each time I convince myself ‘To never let it get that bad again.’ Then as predicted it spectacularly breeds to an even worse state. 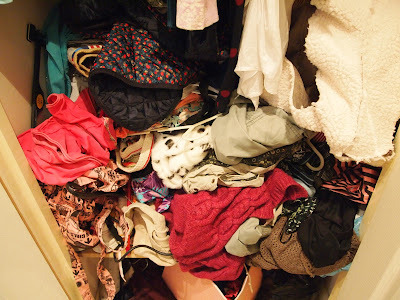 I am so messy when it comes to clothes, I don’t care at all if something gets squashed, creased, or forgotten about. I really am that bad clothes person. I also have the worst hoarding nature. I have clothes I haven’t worn for years hung up and I have no idea why. I always dreamt one day I would appear on Gok’s How to Look Good Naked and he would banish all my clothes, tell me off and that would be it, lesson learnt. The thing is, I am nearly twenty-four, should I really still be throwing clothes around? Shouldn’t I have got that dream capsule wardrobe by now? I have always been like this. If I try something on and it doesn’t look right, I will almost instantly fall out of love with it, and then most likely it will get shoved back into the closet, and eventually spat out and regurgitated again. Clothes can be replaced. But can bad habits ever change? I'm 55 and still throwing clothes around. Now and again I tidy my wardrobe then before I know it it's back to everything in a heap at the bottom again! With me it gets one go and if it ain't right, it's out. My wardrobe's still an absolute shambles but at least I like everything in it. Since moving out of the parents house i've gone back into my uni ways of being messy, it's not even messy in my closet, it's messy on the floor in the corner of the bedroom. It's really bad. It's not that I even had a lot of clothes - I moved with enough for like a week and never rebrought stuff, so I really have no excuse. My wardrobe is so messy and packed full of things I never wear, the thought of sorting through it is just too much haha. I don't actually have a wardrobe at present, all the clothes I own fit into one chest of drawers - I'm not sure whether to be happy or sad about that! Definitely guilty of dumping a pile of clean washing on a chair and using that as a wardrobe though! I have the world's messiest wardrobe, I just cannot be ruthless!